Contemporary expansive child-friendly villa, offering stylish luxury living and extensive facilities. Amenities TV room, TV/DVD in all bedrooms with iPod docks, sound systems throughout, WiFi internet, air-con bedrooms, generator, fully-equipped kitchen, BBQ, yoga studio/games room with table-tennis, outdoor projector screen, access to gym and sea kayaks. 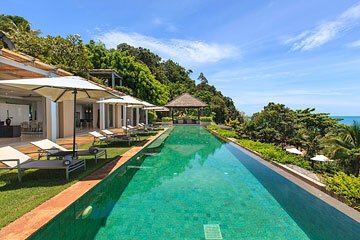 Sangsuri Villa 1 is an expansive 9 bedroom beachfront villa, sleeping up to 18 adults, or 14 adults and 16 children. Set on the northern reaches of Chaweng beach, within convenient proximity to the island’s main attractions, yet secluded from the crowds, Sangsuri Villa 1 is stylishly designed in contemporary style, with detached thatch-roofed pavilions amidst lush tropical gardens on several terraces that cascade down the slope from the entrance to the beach. Sangsuri Villa 1’s extensive facilities include a TV room, outdoor cinema, complimentary WiFi internet, indoor and outdoor sound system, kid’s room, nanny’s room, beautiful tropical gardens, BBQ, in-villa chef service, a 22 metre infinity-edge swimming pool, direct beach access, and incredible sea views across Chaweng bay and Koh Matlang. Electric wooden gates open into the entrance courtyard. There are two pavilions at this upper level, the first of which features the games room and a TV room on the ground floor, with the kid’s dorm, and a twin bedroom upstairs. The games room includes a table tennis set and a shower room. The white oak floors and floor-to-ceiling windows make an ideal yoga studio. A comfortable TV room is furnished with sofas, and includes the latest high-end audio visual technology. Above the games room is the kids’ dorm, with 6 bunk beds and 2 pull-out beds, wooden flooring, a plush rug, and brightly coloured beanbags. This room has an en-suite shower room, toys and a sound system, and it provides a safe and fun environment for children to play and sleep in. Opposite the kid’s room is a twin bedroom with an en-suite shower room and sea views. The second pavilion comprises a garage and laundry room downstairs, with staff quarters upstairs, as well as an office. From the courtyard area, a reception pergola opens onto broad steps leading down to the main residence. 4 bedroom suites are situated on the next 2 levels, all with king-size beds. The 2 upper bedrooms are surrounded by ponds and private gardens, with sun-loungers overlooking the sea. Both bedrooms have an integrated audio/visual system, vaulted ceilings, fitted wardrobes, and en-suite bathrooms with indoor and outdoor showers, sound systems, and sea views. The 2 lower level bedrooms share a front garden. Both bedrooms feature LCD TVs, audio systems, walk-in wardrobes, and en-suite bathrooms with twin sinks and walk-in rain showers. One bedroom also has a free-standing bathtub in the outdoor bathroom, while the other bedroom has an outdoor shower with sea view. Stone steps lead down to the main living level, including the 22 metre long swimming pool, lounge and dining areas, the kitchen, and a bar. The main living pavilion is glass-fronted, with foldaway doors that open onto the pool and sea views, and features a mirrored rear wall that adds light, accentuates space, and ensures sea views from all directions. Across the entire length of the living pavilion is a bamboo and glass Sangsuri1red patio, which is separated from the pool by a grass lawn furnished with sun loungers. The infinity lap-pool has a large sala pavilion at one end, completed with comfortable built-in sofas and cushions. The main living pavilion includes a spacious lounge, with sofas and armchairs arranged around a coffee table. At the centre of the living room, the large wooden dining table can be configured as a square seating 12, or as a long banquet table for gatherings of up to 20. The bar features a teak-wood island with bar stools, a wine-fridge, bar, and coffee machine for preparing poolside drinks. Between the bar and the fully-equipped kitchen is a courtyard with a large gas BBQ. Next to the kitchen is a bathroom and shower for easy access from the pool, and to the left is another thatched sala pavilion with a double daybed. On the level below is the master bedroom suite, which includes a King-size bed, LCD TV/DVD and audio system, walk-in dressing area, and en-suite bathroom with twin-sinks, walk-in shower and a stunning outdoor tub overlooking the sea. The master suite opens onto a terrace and expansive grass lawn leading to the beach. On the far right of the lower garden is a private massage pavilion with two massage beds, sun loungers, an outdoor cinema and sound system. Sangsuri Villa 1 offers a prime beachfront location, combined with a great sense of space and luxury, myriad facilities and venues, and is an ideal holiday home for larger parties with children. Sangsuri Villa 1 is located between Choeng Mon and Chaweng beach on a secluded beach, minutes away from a wide range of restaurants, shops, spas, and bars. 5 minutes drive from downtown Chaweng to the south and Choeng Mon to the north, 7 minutes from the airport, 15 minutes from Bophut Fisherman’s Village, and 30 minutes drive away from the Santiburi Golf and Country Club. Rates are for exclusive use of the property, with base rates for 2 bedroom occupancy for up to 4 guests. Each additional bedroom is charged at a daily rate of $100++ USD for up to 2 guests. 2 dorms are available, each accommodating up to 8 children, or 6 adults, at a daily charge of $200++ USD. -Yoga studio/games room with table tennis. -Expansive living/lounge area with sofas, bar, and dining table. -Indoor and outdoor sound system with iPad controls. -All bedrooms are air-conditioned and have fans. -All bedrooms with LCD TV/ DVD and iPod docks (no cable TV to bedrooms). -2 dorms, each with 6 bunk and 2 pull-out beds. -5 bedrooms with king-size double bed. -Massage beach sala for two, with privacy screens. -Safety box in all bedrooms. -TV room with 50” LCD TV and 70+ cable channels. Thai massage, oil massage, facial, body-wrap, manicure or pedicure at the privacy of your villa.